By Lauren Carroll, Allison Graves on Monday, January 16th, 2017 at 12:40 p.m.
By Allison Graves on Tuesday, January 31st, 2017 at 8:13 p.m.
Not even two weeks into his presidency, Donald Trump nominated Judge Neil Gorsuch on Jan. 31 to fill the late Justice Antonin Scalia's seat on the Supreme Court, making good on one of his campaign promises. 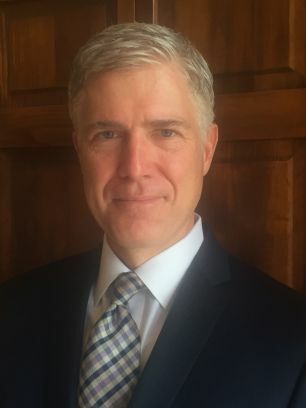 Gorsuch, 49, is a U.S. judge for the Court of Appeals for the 10th Circuit based in Colorado. He was nominated to his post by George W. Bush on May 10, 2006, and confirmed by the Senate by a voice vote. Just like Scalia, Gorsuch is described as a conservative, textualist and an originalist, which refers to someone who interprets the Constitution as it was originally written. "I took the task of this nomination very seriously. I've selected an individual whose qualities define — really, and I mean closely define — what we're looking for. Judge Gorsuch has outstanding legal skills, a brilliant mind, tremendous discipline and has earned bipartisan support." Trump said Jan. 31, 2017. Despite never writing opinions addressing Roe vs. Wade, Gorsuch is perhaps most notable for his opinion in Hobby Lobby Stores v. Sebelius, in which he aligned himself with corporations that believed the "contraceptive mandate" of the Affordable Care Act infringed on their religious beliefs. "It is not for secular courts to rewrite the religious complaint of a faithful adherent, or to decide whether a religious teaching about complicity imposes 'too much' moral disapproval on those only 'indirectly' assisting wrongful conduct," he once said in an opinion. Now Gorsuch's nomination moves on to the confirmation process where the Senate will hold hearings to vet him, and then vote on whether to confirm him. Russell Wheeler, a judicial expert with the Brookings Institution, said recent Supreme Court confirmations have taken more than two months, and predicted Gorsuch's nomination could take the same amount of time or even longer, given Democrats' fury over what they call a "stolen seat." Republicans refused to take action on President Barack Obama's nominee, Judge Merrick Garland. Trump won't face the same challenge Obama did because the Republican Party controls both the White House and Congress, but that's not to say Democrats won't put up a fight. "We are not going to settle on a Supreme Court nominee," Senate Minority Leader Chuck Schumer said Jan. 3. "If they don't appoint someone who's really good, we're going to oppose him tooth and nail." Some Senate Democrats have threatened to filibuster the nominee, a tactic the Trump administration has criticized. In an interview with Fox News' Sean Hannity on Jan. 26, Trump said he "would" encourage Senate Majority Leader Mitch McConnell, R-Ky., to end the 60-vote threshold on nominees to the high court — also known as the "nuclear" option. The "nuclear" option would drastically change the Senate rules on the majority vote by allowing the Senate to override a rule by a simple majority of 51 votes, rather than a supermajority of 60 votes. This option was last used in 2013 by former Majority Leader Harry Reid, D-Nev., to move forward the confirmation of Obama's judicial and executive nominees. McConnell hasn't said whether he'll use the nuclear option, but in 2013 he called Reid's action a "power grab." "My sense is that some Democrats might be on the fence about filibustering, not least because of the risk that Republicans might retaliate against a successful filibuster by going nuclear to ban Supreme Court filibusters," said Sarah Binder, a political science professor at George Washington University. A day before Trump's announced his pick, McConnell urged Democrats to confirm Trump's pick on the Senate floor. "The Senate should respect the result of the election and treat this newly elected president's nominee in the same way the nominees of other newly elected presidents have been treated -- and that is with careful consideration followed by an up-or-down vote," McConnell said Jan. 30. During the election, Trump pledged to nominate a Supreme Court justice from a list he had made publicly available. Gorsuch was indeed on that list, so we rate this Promise Kept. PolitiFact, Trump-O-Meter: "Nominate someone from his list of justices to replace Antonin Scalia," Jan. 16, 2017. The Washington Post, "Reid, Democrats trigger 'nuclear' option; eliminate most filibusters on nominees," Nov. 21, 2013. Email interview, Sarah Binder, professor of political science, George Washington University, Jan. 31, 2017. Email interview, Russell Wheeler, visiting fellow, Governance Studies, Brookings Institution, Jan. 31, 2017. Email exchange, Steve Cheung, White House spokesperson, Jan. 31, 2017. By Lauren Carroll on Thursday, January 19th, 2017 at 11:43 a.m. When conservative Justice Antonin Scalia died unexpectedly just ahead of the presidential primaries, it made the Supreme Court a focal point of the presidential race. Donald Trump promised that he will fill Scalia's seat with someone of a similar ideological bent. He released a list of potential appointees who meet his requirements, which include favoring gun rights and overturning Roe vs. Wade. "I am looking to appoint judges very much in the mold of Justice Scalia. I'm looking for judges — and I've actually picked 20 of them so that people would see," he said during an Oct. 9, 2016, debate. Before Scalia's death, the nine-justice court was relatively balanced — with four consistent liberals, four consistent conservatives, and Anthony Kennedy, who is conservative but occasionally sides with the liberal justices. President Barack Obama's choice to replace Scalia, Merrick Garland, would have given the court a left-leaning edge. So Republicans in Congress refused to consider Garland, in hopes that a Republican would win the White House and appoint someone more conservative. During the campaign, some Republican leaders who didn't care for Trump said they would support his candidacy regardless because of the open Supreme Court seat. Trump is expected to follow the standard process of appointing a Supreme Court justice. He will announce his nominee; the Senate will hold hearings to vet him or her; and the Senate will vote on whether to confirm. Trump won't face nearly the same challenge Obama did because when he becomes president because the Republican Party will control both the White House and Congress. But Democrats have vowed to put up a fight. "We are not going to settle on a Supreme Court nominee," said Senate Minority Leader Chuck Schumer Jan. 3. "If they don't appoint someone who's really good, we're going to oppose him tooth and nail." Supreme Court nominees have to clear a 60-vote threshold in the Senate. However, Republicans have just a 52-48 edge, so they will need support from at least eight Democrats. If the Republicans don't get that support, they might decide to remove the 60-vote requirement, which would be a significant change to Senate rules. Scalia's open seat has left the Supreme Court slightly handicapped with fewer than nine justices for almost a year. The eight justices have declined to take up several significant cases, out of concern that they would result in a 4-4 split decision. So it's expected that Trump will make an appointment soon after taking office, and how long the confirmation process takes will depend largely on how the debate in the Senate unfolds.